It can be overwhelming looking at the image above. There are many tools and philosophies that your company can utilize in working towards continuous improvement, but what are the best options for you and your organization? Many of these resources are associated with jargon and buzz words that have the potential to generate fear or confusion with employees, and this can result in resistance to change. UT CIS employees have extensive experience in continuous improvement training and implementation, and we can help your organization understand the concepts and embrace the philosophy. With this approach, we recommend learning and utilizing specific tools and methods to solve the problem at hand. 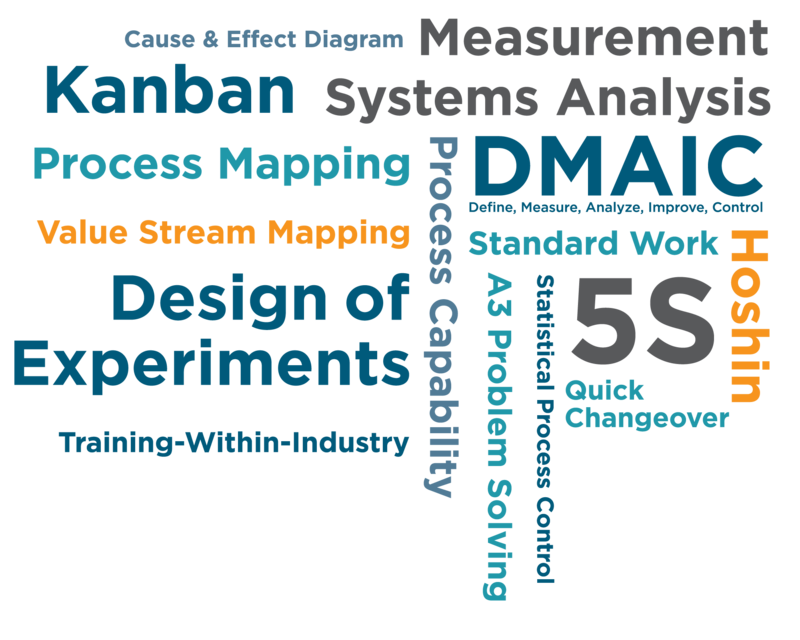 These tools and methods derived from Lean Manufacturing, Six Sigma, Kaizen, Toyota Kata, Total Productive Maintenance and Total Quality Management Systems. This approach incorporates rapid cycles of user-learning and coaching to build a customer focused and improvement driven culture in your company. Your team will incrementally overcome any obstacles as you advance towards your vision of operational excellence. If your organization wants to improve performance in safety, quality, delivery, cost and morale, we can help develop a vision for improvement, assess the current condition, set short and long term goals, and formulate an action plan with training change management for success. Contact your local solutions consultant to schedule an appointment where we can learn more about your challenges.